A stroll through the seasonal aisle of any supermarket this time of year provides evidence of the enduring relationship between chocolate and Valentine’s Day. Milk chocolate hearts wrapped in red foil, heart-shaped velvet boxes filled with handcrafted dark chocolate truffles, and packages of chocolates tied with ribbon — these are but a few of the mouthwatering choices offered to shoppers searching for the perfect sweet gift. How did chocolate and a day dedicated to love become so entwined? Much like chocolate melts in the mouth, it’s been melting hearts for generations. Ancient Aztecs believed cacao, a gift from the god of wisdom, was an aphrodisiac. It was served as a bitter, frothy drink, and became so revered that cacao beans were used as a form of currency. It was only when cacao was introduced to Spanish court by friars returning from the Americas in the 1500s, and was mixed with sugar or honey, that chocolate gained popularity in Europe. Today, Belgian and Swiss chocolatiers are some of the best in the world. One of my favorite hearts comes from my oven as a dense, single-layer, dark chocolate cake wrapped in a decadent coating of deep chocolate ganache, made even more irresistible by its feathered white garnish. This Chocolate Valentine Cake is surprisingly easy to make, and the only special equipment needed is a single 9-inch heart-shaped cake pan. Set the stage for a romantic evening by orchestrating a candlelight dinner à deux. For couples with young children, when going out isn’t worth dealing with crowded restaurants, make a family celebration, complete with red and white streamers, red placemats, Valentine napkins, heart-shaped confetti, and a small vase of red and white blossoms. Add brownies or a cake, and a kid-decorated “mailbox” to hold Valentine cards, and you have all the ingredients for a memorable evening the entire family will love. Preheat oven to 350 degrees. In the large bowl of an electric mixer, cream butter and sugars until light and fluffy, about 8 minutes. Add eggs and vanilla, beat well, and set aside. In a medium bowl, stir together cake flour, cocoa, baking powder, salt, and baking soda until well blended. Gradually add flour mixture to creamed mixture, alternately with the milk, until the batter is thick and creamy.Grease and flour a 9-inch heart-shaped pan. Spoon the batter into pan and bake 30 to 35 minutes, or until a cake tester comes out clean. Cool cake 30 minutes, remove from pan, and cool completely on a wire rack. Finely chop chocolate with a sharp knife and transfer to a medium bowl. Pour cream into a medium saucepan and bring to a boil over medium heat. Pour the hot cream over the chocolate and whisk slowly and gently to melt the chocolate. When the ganache is smooth, place the cake on a wire rack over a tray covered with parchment paper. Spoon ganache onto cake and smooth it over the sides with an offset metal spatula until completely covered. In a small bowl, whisk together powdered sugar and milk until it is smooth. Pour the glaze into a decorator bag fitted with a small plain tube, or pour it into a small plastic zipper bag and snip a tiny hole in one corner. Pipe straight horizontal lines of glaze across the cake at 1-inch intervals. Drag a sharp knife through the glaze at ½-inch intervals from the top to the bottom of the cake to create a feathered pattern. 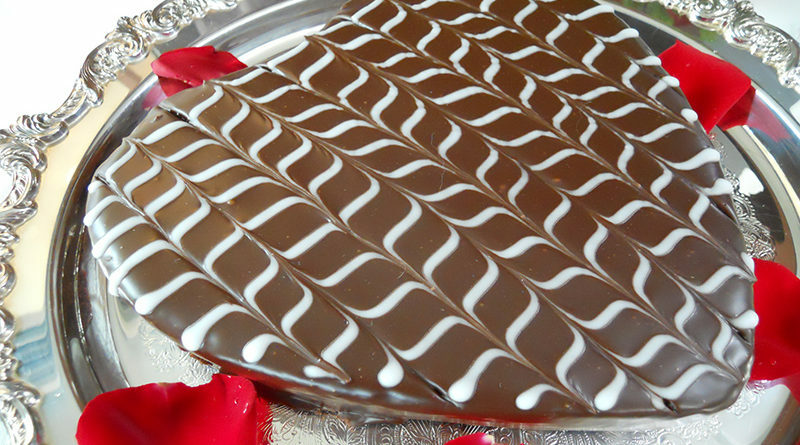 Allow ganache to dry completely, and carefully transfer the cake to a serving platter with a wide metal spatula.